When a person has venous insufficiency, his body is unable to circulate blood properly to the legs and back around to the heart. Venous insufficiency is sometimes referred to as CVI--the C stands for chronic--and can lead to conditions such as varicose veins and deep vein thrombosis (DVT). Deep vein thrombosis is a potentially serious condition in which a blood clot forms in the legs and can travel throughout the body, posing a risk for stroke. People with venous insufficiency can take medications to help their condition, but dietary supplements may also help treat the condition. Always speak to your doctor before beginning any supplement regimen. Horse chestnut goes by many names: buckeye, Spanish chestnut and Aesculus hippocastanum. The plant is native to the Balkan region, and almost the entire plant can be used for medicinal purposes. The seeds of the horse chestnut plant are found to be effective in treating CVI, according to the National Center for Complementary and Alternative Medicine (NCCAM). The seeds are pressed into an extract that contains an active ingredient called aescin, sometimes also spelled escin, that is used to promote healthy blood circulation in people who suffer from venous insufficiency and also hemorrhoids. Horse chestnut seed extract is standardized at a concentration of between 16 and 20 percent aescin. PeaceHealth, a resource for natural treatments, recommends two to three dosages of horse chestnut seed extract at a strength of 300 mg.
A dietary supplement group called flavanoids may be a natural alternative to consider for the treatment of varicose veins and other forms of venous insufficiency, according to PeaceHealth. Flavanoids are pigments found in plants and food. Two flavanoids that can benefit CVI sufferers are grape seed extract and bilberry. The University of Maryland Medical Center (UMMC) explains that grape seed supplements contain not only flavanoids, but also oligomeric proanthocyanidin complexes (OPC), an antioxidant that can also maintain proper circulation. Grape seed is available as a pill or liquid extract. Recommended dosages for adults with vein disorders range between 150 to 300 mg daily. Bilberry is another flavanoid-rich supplement to consider for CVI. The fruit can be steeped into a medicinal tea or taken as a liquid extract. Patients should consult their doctor to determine appropriate dosages based on their medical condition and the type of bilberry extract they plan to use. Butcher's broom gets its name from the look of the plant, as the bush is filled with spiny green leaves that were used as a cleaning device. According to PeaceHealth, this herbal supplement contains substances that contain steroidal properties, which can tone veins that are damaged from insufficiency issues. Liquid extracts are prescribed at 100 mg three times daily. 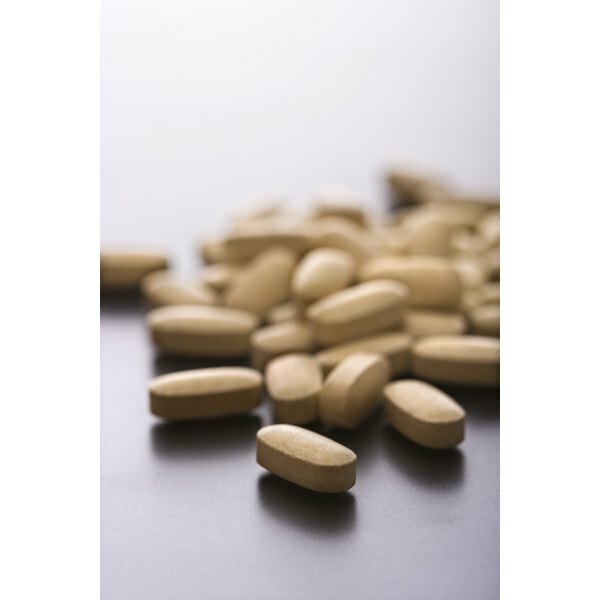 Recommended doses of capsule forms of the supplement are 1000 mg three times a day. Butcher's broom is sometimes used along with vitamin C supplements for optimum results, as reported in a 2000 issue of the journal "Angiology." Gotu kola is an herbal supplement used across Asia to reduce swelling that is associated with venous insufficiency, according to UMMC. The leaves and stem of the plant are part of the parsley family, and are made into teas, tinctures and standardized extracts. The most commonly prescribed form of the supplement for CVI is 90 to 120 mg of standardized extract taken on a daily basis. Can Herbs Strengthen Capillary Walls?